Recycling has always been a bit confusing: Can glass jar lids be recycled? Does soiled cardboard go in the green bin or the blue bin? And what do the numbers on the bottom of plastic containers mean, anyway? But when China enforced strict recycling sanctions through a 2017 policy called "National Sword" - which bans 24 types of solid waste (various plastics and unsorted mixed papers), and sets a tougher standard for contamination levels at no more than 0.5 percent - a new wrinkle was added to the recycling mix. Acceptable waste must not only fit specific guidelines and go into proper bins, but recyclable waste must now be clean as well. The folks at RecycleSmart understand that washing trash would be counterproductive to local water conservation efforts, and they don't encourage wasting a lot of water to clean out food containers. They suggest rinsing out containers in dish water after you finish washing the dishes or putting containers in the dishwasher when you run a load. Residents can also wipe out dirty containers with a paper towel and throw the towel into the green recycle bin, which is not just for grass clippings or tree branches anymore. Any soiled paper items (pizza boxes, used napkins, etc.) should be recycled via the green bin. Of course the best form of recycling is to reduce total waste entirely. Ashley Louisiana, waste prevention and recycling manager at RecycleSmart, is pleased with Moraga's recycling efforts. "The Town of Moraga is currently at 2.3 pounds per person, per day - our lowest throughout the service area, which is very good. 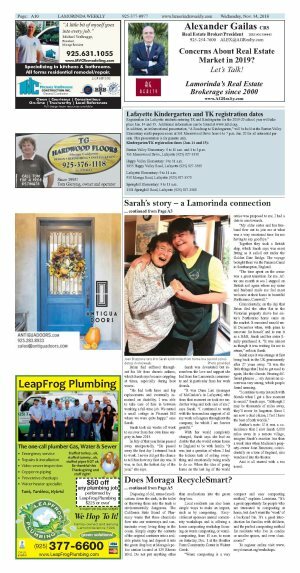 Moraga doesn't have a large commercial base, which means residents carry the majority of the responsibility." All jurisdictions report to the state of California (CalRecycle) annually, said Louisiana. "Our per capita target is 4.7 pounds per person, per day (the state provides a calculation-based target). Each jurisdiction has to meet their target to meet Assembly Bill (AB) 939's 50 percent diversion requirements. RecycleSmart is well below our target and meeting our state requirements." Last year's diversion rate as a regional agency for the entire service area was 60 percent. While humankind works on a viable solution to its waste problems, there are measures that Moraga residents can take which are good for the environment, as well as the wallet. While plastic bags at local grocery stores are a thing of the past, plastic bags like those that hold loaves of bread or cover newspapers during a rain storm can be used in a secondary way, like when picking up after your dog when you go on a walk. Any used cans of household paint can be given to many hardware or paint stores who in turn donate your colorful leftovers to schools or other needy organizations, provided the labels are still intact and the cans are tightly sealed. Lucky enough to own a home that has natural hardwood floors? Don't cover them up with carpets. Carpets may look nice, but can be packed with pollutants, are not good for people who have certain allergies and must usually be replaced every 10 years, according to the American Lung Association. And if you're shopping for new furniture, make sure you only buy wood certified by the Forest Stewardship Council. The council notes wood that is tagged with this logo has been harvested in a more environmentally friendly way than wood used to make conventional furniture. Disposing of old, unused medications down the sink, in the toilet or throwing them into the trash is environmentally dangerous. The California State Board of Pharmacy warns that these chemicals flow into our waterways and contaminate every living thing in the ocean. Simply empty the contents of the original container into a sealable plastic bag and deposit it into the green drop box at Moraga's police station located at 329 Rheem Blvd. Do not put anything other than medications into the green drop box. 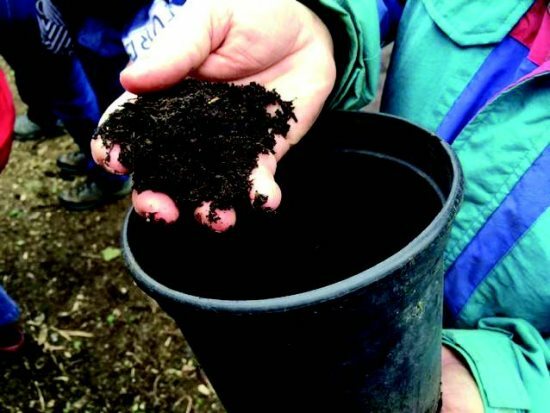 Local residents can also learn simple ways to make an impact, such as by composting. RecycleSmart sponsors annual community workshops and is offering a home composting workshop focusing on worm composting, or vermicomposting, from 10 a.m. to noon on Saturday, Dec. 1 at the Heather Farm Community Center in Walnut Creek. "Worm composting is a very compact and easy composting method," explains Louisiana. 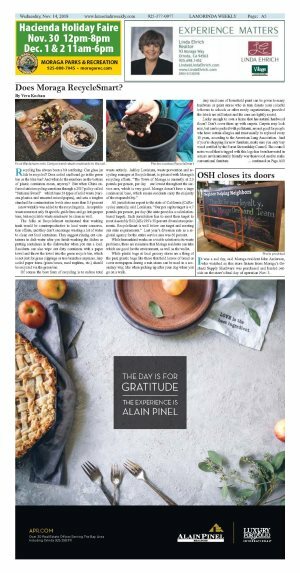 "It's a great opportunity for people who are interested in composting at home, but don't want the 'work' of a backyard bin. 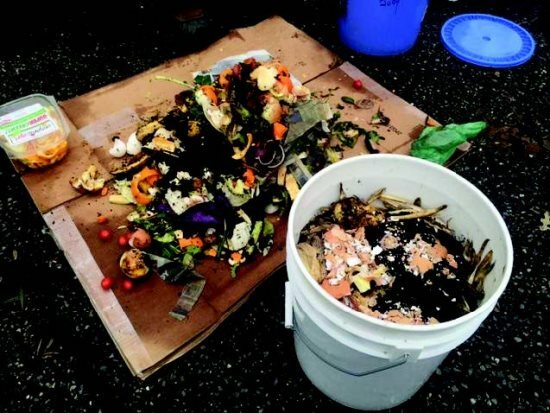 It's a great introduction for families with children, and the perfect composting method for residents who live in condos or smaller spaces, and even classrooms!" To register online visit www.recyclesmart.org/workshops.